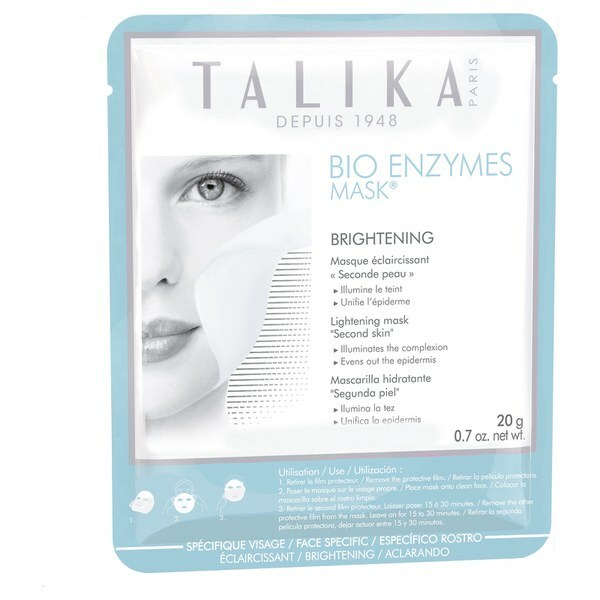 Revive your complexion with Talika Bio Enzymes Brightening Mask, a serum-infused sheet mask saturated with a host of beneficial ingredients to illuminate and even out your skin tone. With a three dimensional structure that enables it to retain and deliver a high concentration of active ingredients, the face mask clings comfortably to your face like a 'second skin'; it infuses the complexion with energising components, including Bearberry and Aloe Vera to enhance natural radiance and improve tone and evenness for a regenerated complexion. Use the Bio Enzymes Mask® twice a week. Remove the protective film from both sides of the mask. Place the mask on to your face then press it with your fingertips to ensure it clings perfectly. Leave it on for 15 to 30 minutes. Make the most of this time to relax. Detach the mask and rub the excess serum in by gently massaging the skin. Aqua/Water, Glycerin, Butylene Glycol, Sodium Hyaluronate, Aloe Barbadensis Leaf Extract, Chlorphenesin, Arbutin, Arnica Montana Flower Extract, Gentiana Lutea Root Extract, Achillea Millefolium Extract, Artemisia Vulgaris Extract, Fragrance, Carbomer, PEG-60 Hydrogenated Castor Oil, Limonene, Linalool.